Mission Innovation (MI) reaffirmed in Davos the strong partnership, established at the 2nd MI Ministerial in Beijing, with the World Economic Forum (WEF). MI and WEF are committed to making a real step–change in clean energy innovation by bridging the gap between new technologies and market uptake. New innovative ideas discussed in Davos are expected to be presented at the 3rd MI Ministerial this year in Malmö. Global leaders gathered in Davos for the World Economic Forum’s 48th Annual Meeting on 23rd -26th January focused on the leitmotif Creating a Shared Future in a Fractured World. 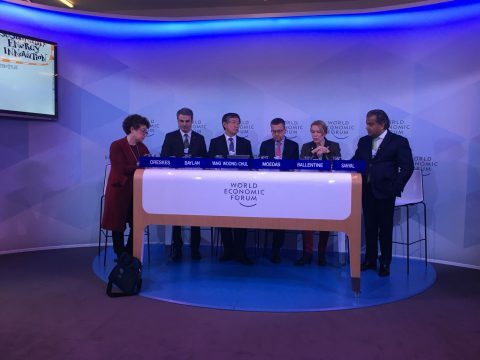 In Davos, MI was represented by the Swedish Minister for Policy Coordination and Energy, Ibrahim Baylan, the EU Vice-President for the Energy Union, Maroš Šefčovič and the EU Commissioner for Research, Science & Innovation Carlos Moedas. They were involved in two energy innovation sessions: the Stewardship Board Shaping the Future and Accelerating Sustainable Energy Innovation. The Stewardship Board Shaping the Future panel focused on how to maximise impact of public-private collaboration on energy. Although many technologies and solutions are already available today, the biggest impact opportunity resides in accelerating their introduction to market and enabling early scaling. The MI alliance with WEF is, in this context, an opportunity to catalyse progress and innovation, bridging the gap between RD&D innovation and market uptake. The Accelerating Sustainable Energy Innovation session was the arena for discussing the role of renewables in creating a shared future. The panel, moderated by the Harvard Professor Naomi Oreskes, brought together in a dynamic dialogue on accelerating technological innovation, representatives from the public sector, Minister Baylan and Commissioner Moedas, private sector, Yang Woong Chul, Vice-chairman of the Hyundai Motor Group and Dev Sanyal, Chief Executive, Alternative Energy, and the no-profit sector, with Miranda Ballentine from the Rocky Mountain Institute. The systematic change that policy makers must lead in terms of financing technological innovation requires a complementary intervention from private sector and a shift driven by people and companies. Consumer behaviour and incentives are in fact crucial for market uptake, it was emphasised, as often where technology fails is not the early R&D phase but in the pre-commercialization, where need buyers to take a risk and change rooted habits. Finally, what clearly emerged from both these sessions was that business as usual is not enough to meet climate goals set under the Paris agreement and that it is crucial to accelerate the pace of clean energy innovation and to enhance public-private collaboration. Baylan, Moedas and Šefčovič warmly invited session attendees to the MI3-CEM9 Ministerial, where specific announcements from the WEF are expected. The Ministerial will have a strong focus on private sector engagement and aims to unlock private sector investment into cutting-edge technologies able to accelerate clean energy innovation.